There's too much to handle! Ben King is a contributing writer to Boston Hassle. I have too much to watch. Every year, I go through this dilemma of what to watch, listen to, read, write, and so on. It’s bit of a cluster of things that pile up over time. I enjoy a lot of what I do, but I always have this urge to keep going. My New Year’s Resolution is to be more creative and to get more out of what I take in. 2018 did not have much from me in terms of anything creative. I lacked any sense of writing or doing any of the 3D work that I did for four years in college. I want to get back into that. With that said, I always have time to watch something at the end of the day. Many of these have impacted me in some way. I tried keeping two of theses entries brief (you will know once you get there) even though I could go on for hours about them. Forget the numbers, and enjoy the art. Sam Raimi is a director we easily identify as the man who gave us the Evil Dead and Spider-Man trilogies. Amidst his filmography, there is A Simple Plan, an outstanding drama in which the film’s characters are always in over their heads. When Bill Paxton, Billy Bob Thornton, and Brent Briscoe discover some money lying in the woods, they find new ways to make their simple plan (no other way to put it) into something much more complex than it needs to be. Ultimately, it would never have worked in the end if they didn’t keep changing the plan. Raimi’s humor resides here in a very different way. The slapstick of Army of Darkness or his lesser-known, wonderful film Darkman is replaced by dark humor. The repetitive, dangerous nature of the trio becomes comical as they continue to not realize how bad they have it. The imagery of bleak, snow covered farmlands and small town shows off Raimi’s eye as a director. He can dive into different frames of mind and ideas while keeping his vision clear. It’s tough to talk about this movie without giving away a bunch of plot points, but I recommend watching it if you haven’t already. For me, that summarizes a lot about A Serious Man: a man swimming in a pool of hysterics while the masses watch him attempt to float. Over the course of the film, Professor Gopnik goes through many conflicts. His wife is divorcing him, his children are reaching the age where they feel like they know everything, he might lose his job, his beliefs are now being questioned, and more. Internally, the apocalypse is happening to Gopnik. It’s only fitting that the film takes place in a late ’60s suburban neighborhood, a community we often think is so perfect and void of problems. History books and corporations love to show off that kind of life, but the Coen brothers choose this “ideal” area for their film about the infinite problem of man. The film opens with a Yiddish folktale written by the Coen brothers for the film. At the end, it suggests that Gopnik will be the one to be burdened with the curse set by the wandering soul. This kind of divine intervention into a life is present throughout the central conflict. There’s a constant Jewish presence in the film as the Gopniks’ son, Danny (Aaron Wolff), will have his Bar Mitzvah soon. These repeated images of religion bearing down on Stuhlbarg’s character is a reminder to us he might truly be cursed. There feels like there is no way out of it. As with any bump in the road, there’s usually a simple solution. Larry Gopnik is a man of science and logic, so his mind is always thinking about the “correct” way to overcome his problems. We gather the problems had solutions once before, but Gopnik’s mind wouldn’t see the simple truth. The time for resolution has passed, as we see with his family. A Serious Man left quite a mark on me. It’s a film I’ve mulled over for some time since I watched it. At the moment, it’s my favorite Coen Brothers film. It’s a fascinating, apocalyptic tale with no real solution. An uplifting, heartbreaking, and thought-provoking tale of suburbia. There is such an immense number of coming of age films and books these days that it is hard to find one that sticks out from the crowd. I don’t mean ones that get attention; in my opinion, many of the ones that get said attention often are cut-and-paste. This leads to a plethora of works that feel like they must capture the same pathos, ideas, and structure as others in their genre. It is not common for me to find one that perfectly identifies itself as something special. A piece of work that feels genuine when it speaks for the audience that it is acknowledging. Lady Bird is a dramatic, honest, pure, loving coming of age film that many people can identify with. The age of social media impacts us all. Lady Bird is set in the early 2000s, which is a huge benefit to the movie. Instead of worrying about characters’ Facebook conversations, we are zoned in on Saoirse Ronan and company. As I mentioned earlier, there are many aspects of the film that are relatable, even if you didn’t go to high school in that time. Director Greta Gerwig ensures that the dilemmas these characters are put through can resonate with people today and, perhaps, years from now. Take for example the relationship of Lady Bird, her mother (Laurie Metcalf), and her father (Tracy Letts). It’s a multi-dimensional relationship, carefully put together. We have moments of nothing but love from Metcalf’s character. There’s a scene where her and Lady Bird run around going to open houses. A montage to celebrate dreams that the two share of having a life that might never come. We see the beautiful connection between mother and daughter. There are also moments of frustration. Any high school student looking at colleges can tell you it is never easy. Some might have one, if not two, parents saying what you want to do is just not what they want. They project their hopes onto you, making you feel you cannot be yourself. Metcalf’s arguments and scuffles with her daughter don’t come across as too mean toward the character; it just feels honest. Tracy Letts’s character has a heart-warming, sweet nature to him. He also has his daughter’s back, constantly giving her confidence, even though his depression is something to take care of. He puts her first. My heart swells with each scene the two interact. Besides the family aspect, the interactions with students and friends never feel fake. They don’t have this false idea that everyone is perfect. We don’t have the generic weird buddy, the dramatic friend, or the overly aggressive bully. We do have a clique of girls that treat others poorly, but there’s not feeling of over dramatization here. The issues the students go through are resolved on their own terms, not by a writer pulling the cosmic strings to put together some coincidental circumstance. Again, there are many instances, both bad and good, that these characters go through that many can relate to. I’ve thought about this movie about once a week since I first saw it. It left me with much to think about. It deserves every bit of praise it received. It took me way too long to get around to watching this movie (though I could say that about any movie I’ve been watching recently). Frank Henenlotter’s vision is dirty, horrific, and wild. It’s such a simple premise that lends itself to its crummy world that we plunge ourselves into during the duration of the film. It’s a social commentary on the poor living conditions of NYC blended in with a horror comedy that I think about all the time. The comedic, psychological dilemma of Duane (Kevin Van Hentenryck) and deformed twin Belial Bradley is the backbone of the film. Belial is carefully introduced to us. The pacing builds up the mystery of what horrifying creature we will eventually see, as Duane is in this constant downward spiral. The reveal is nothing short of iconic. The creature is a perfect puppet. In light of their budget, the crew make perfect use out of what little they had. The stop-motion they use in several scenes also looks impressive. It goes to show you that even with a budget as low as it is, anyone with an idea can accomplish it. The monster movie Henenlotter set out to make succeeds in just that. There are so many standout moments of Belial, Duane interacting with the scummy characters he lives around, and the excellent reveal of the brothers’ history. It’s kind of sweet seeing Duane taking care of his brother? He goes out of his way most of his life to ensure this terrible person(?) can live in some manner of speaking. I love it. Henenlotter went on to direct two more sequels, which are also hilarious and imaginative monster flicks I recommend. He also directed Brain Damage, which is a ridiculously good film everyone should see. In short, Lifeforce is about how alien vampires are retrieved from space by astronauts and brought back to Earth, where they wreak havoc on the world. It’s perfect. It all starts on this alien vessel which can easily be interpreted as a womb. As soon as the astronauts enter the ship, Tobe Hooper directs a very surreal scene where the environment feels organic. It looks like the inside of a person, like they’re infants going back into their mother’s womb. It is a bizarre way to look at it, but I’m sure others will back me up here. Besides this notion, the film is a visual masterpiece. From the sets, practical effects, make-up, costumes, and more, Lifeforce is oozing with spectacular visuals. Along with the fantastic work of the crew, Hooper’s direction is excellent. He brilliantly puts together a ridiculous plot and makes it work so well. It’s funny looking at the reviews critics gave it at the time. They, too, call out how ridiculous it is. I do as well, but that’s why I love it. As crazy as it is, there are smart scenes in it. There’s a whole discussion about the soul and the human conscious that reappears during the film. Instead of a higher being that many believe in that gives them their soul, Hooper’s vision is that of a more astronomical and scientific reason. It all plays out in outstanding form. 2018 is the year of Twin Peaks for me. I finally sat down, watched the original series, blew through The Return, and watched Fire Walk With Me. First, The Return is one of the greatest experiences I’ve had watching anything, whether it be film or television. Never have I felt so much uneasiness of not knowing what would happen next. The first two episodes gripped me more than most. I would like to point out I did watch the film before The Return. If you’re unaware, Fire Walk With Me was initially blasted by fans. It didn’t serve as a continuation from the end of season two. It’s a prequel film that focuses on Laura Palmer before her awful murder. I try to put myself in the audience when this first came out. It shouldn’t have shocked many Lynch fans that he would do something like this. He, essentially, got the show ripped from his hands and felt like he had no more control over it. Fire Walk With Me is a passion project because he had his project back. He could do what he wanted. It’s clear that Lynch has a love for the character of Laura Palmer, and he put together a film that has all sorts of Lynch moments. The cryptic nature of many scenes aligns with the show. We never get proper answers, but instead get questions. It’s like when I first finished Lost. I didn’t want answers. I loved interpreting the dilemma myself. Twin Peaks is very much like that, in that Lynch didn’t care about answering every little question he brought up. He doesn’t even care about the show, as he demolishes a TV at the beginning of the film. If you research the backstory of David Lynch and Mark Frost’s relationship with the network they worked with (who helped create the series), you can see how it affected the outcome of the film. Laura Palmer’s murder, in a way, was a release from the nightmare she was in. The film sets up her life as chaotic mess that never seems to end. She takes drugs, her father acts manically, she associates herself with people who take advantage of her, and more. As much as I love the narrative of Twin Peaks, I fall head over heels for the long, drawn out moments. There’s plenty here that serve as purely aesthetic pleasing scenes. Though perhaps I shouldn’t say pleasing, because they can be very uncomfortable. The film can also be terrifying. The moments with Bob always haunt me. I find him the most nightmarish character I’ve ever seen. I could go on forever about Twin Peaks, but I’ll stop here. The film is a perfect backstory into Palmer’s past. When we see her smiling as she is in the Black Lodge, one can only interpret that as a peaceful moment. She is away from Bob, and she can find some solace in the death. It seems as if the hate for this movie has died, even before The Return. It serves as an excellent companion to the series, as well as another great film by David Lynch. Oh, and Laura’s screams are the most horrible sounds known to man. 2018 was also the year of Lynne Ramsay for me. I was floored while watching We Need To Talk About Kevin, and enthralled by Morvern Callar. You Were Never Really Here was my introduction to the Scottish film director. If you haven’t seen it, it is streaming on Amazon Prime right now. If the film was helmed by someone else, I think the narrative wouldn’t have invested me as much as Ramsay does here. On the surface, it’s a story of a mentally ill man who is hired to beat up pedophiles and rescue captured girls. Going off that, there are deeper aspects of the film that delve into Joaquin Phoenix’s character. His history of abuse from his father and traumatizing military and FBI service have left him incredibly depressed. The way Ramsay tells the story through hard cuts to images of suicidal tendencies, care giving, violent acts, and astonishing canvases is incredible. I was on the edge of my seat gripping my heart because I never knew what Phoenix would do next. I grieved for him as I started to learn more about his mental wellbeing. The title suggests that Phoenix’s character takes himself out of the violent acts, mentally, to fully commit to the atrocities. He is absent in the act of killing, because he knows it would only make him worse. This isn’t a mechanism of coping, but rather a way of pushing through, albeit in worst way possible. The ending is up for interpretation. I interpret it as Phoenix will continue to live his life despite the black hole in his soul that will always challenge him. He will be in a constant state of suicidal tendencies, and violent behavior. A tragedy. Now, I can’t help myself but to watch it again. As much as Twin Peaks changed me in 2018, Neon Genesis Evangelion astonished me in ways I didn’t think possible. Its challenging themes, brilliant action scenes, and undeniable charm are the reasons why it has the cult following it does today. I’m glad I’m finally apart of the fandom, as I’ll be revisiting the show and film again very soon. The End of Evangelion has been discussed by many fans throughout the years, so I won’t go on about it. What’s said has already been hammered in, it seems like, by many. Everyone has their own connection to Shinji, Asuka, Rei, and others. It may be the struggles they go through, or the emotions they fight daily. No matter what, one of the main draws for me is the anime itself. The GAINAX team never waste a frame. They intend to show the audience every bit of information in the most artful way they can. The drama is captured in a beautiful manner, the action made my heart stop often, and the end is just… indescribable. I have no idea how they edited it that way, or even how they pulled off the visuals they did. Absolutely stunning. 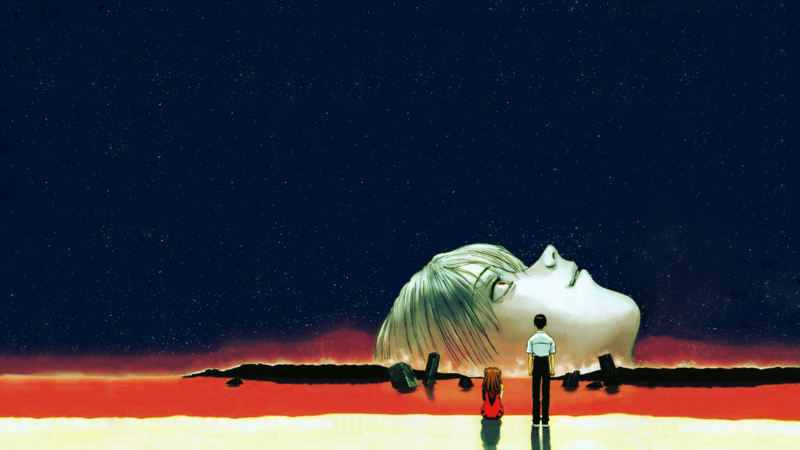 There’s much to be said about The End Of Evangelion, but the ending is perhaps the most important aspect. It encompasses the central conflict of Shinji throughout the series and film. He must choke Asuka because he cannot fully appreciate, nor accept, the love and joy life gives him. As he sits on the barren, surreal landscape that is Earth (supposedly), he still feels the need to purge himself of all human connection. That fear of connection and love fights with the side of Shinji that can be happy. He can smile during the end of the world. Watching him break down like that is a topic of discussion for many fans, but that is the only way I see it. I watched the ending several times on repeat to fully understand what happened. An extraordinary piece of work. I have renumbered, restructured, added, and subtracted this list so many times. Every time, I couldn’t move First Reformed. I’ve watched it three times now, and I can proudly say this is the one film that has stuck with me during 2018. Granted, I did only watch it first in October, but still. Upon first watch, my mind was racing as to the narrative and character arc of Ethan Hawke. Hawke’s Reverend Ernst Toller is a complex individual. He finds a new life in the church after drifting off to an alcoholic lifestyle brought on by factors in his past. This leaves him, I believe, more vulnerable to the trouble that he puts upon himself later in the film. Early in the film, he’s introduced to the very real problem of climate change, leading him to question his religion, mortality, and impact on the world. It’s this conflict that feels universal to others. Director Paul Schrader captures the paranoia of many people worldwide within this one character. This worry builds tension, as we try to piece together what exactly the Reverend will do to find answers. That tension got so bad for me that I had a tiny panic attack near the end of the film. During the last two viewings, I was paying more attention to the camera work. Many scenes are captured with precision. There are no handheld camera moments. The struggle that the Reverend and others in his community go through is captured with wide shots of churches, close ups to capture deep emotions, and more. I found myself pausing the film several times just to see how things lined up in the frame, the way Hawke lines up with industrial plants in the background as the sunrise comes in. First Reformed had to be my favorite film of the year. I just can’t stop thinking about many scenes, the way all of it comes together, and the ending. That ending is brutal. Overall, it’s an exceptional piece of work. I still don’t know why A24 didn’t push this out more, nor do I know why I didn’t see it when it came to a theater down the street in the summer. I wish I did, as I would have more time to think about it all.